The variability in the phytoplankton communities of the Myall Lakes, a series of four interconnected coastal lakes on the lower north coast of New South Wales, was studied between 1999 and 2002. There was considerable spatial variability across the lake system. Bombah Broadwater experienced blooms of Anabaena in 1999 and early 2000, but these were replaced from late 2000 onwards by Chroococcus and a variety of eukaryotic taxa, particularly flagellates and diatoms. In comparison, the phytoplankton community of Myall Lake was dominated for much of the study period by Chroococcus, Merismopedia and chlorophyte taxa. The sites located midway between these two main lakes represent an ecotone, with elements of the phytoplanktonic flora of both main lakes being present. Changes in phytoplankton community composition in Bombah Broadwater occurred fairly frequently. In contrast, the phytoplankton community in Myall Lake changed little during the course of the study and can be considered as being at long-term equilibrium. The reasons for this lie in the morphology and hydrology of the lake system, which in turn create gradients in a number of physico-chemical water quality attributes. Bombah Broadwater is influenced by episodic and stochastic freshwater inflows from the upper Myall River catchment, and in times of drought by saline marine incursions via the lower Myall River. Myall Lake however represents a cul-de-sac, with only a small hydraulic connection to the remainder of the lake system. As it has little input from its small catchment, the limnological conditions within this lake remain relatively constant for long periods of time. Although no patterns of seasonal succession were discernable in any of the lakes, some longer-term (annual) changes did occur, and certain taxa displayed enhanced growth in summer. Salinity was found to be an important factor in determining phytoplankton community composition and abundance. Canonical Correspondence Analysis of phytoplankton and environmental data for all sites combined, showed ammonia, total nitrogen and salinity (measured as electrical conductivity) to have the most influence on the phytoplankton community composition and abundance. Anabaena growth was positively related to ammonia concentration and negatively related to conductivity. Sampling and data collection was undertaken by the former New South Wales National Parks and Wildlife Service and the Department of Land and Water Conservation. The study was supported initially by funding provided by the two departments, and subsequently by a Coast & Clean Seas Program grant from the Natural Heritage Trust of Australia. Sampling assistance by staff of the two departments (Stephen Smith, Katrina Grey, Katherine Gall, Geoff Mason, Graham Carter, Sue Botting, Nicholas Cook, Matthew Dasey and Joanne Wilson, amongst the many) is also acknowledged. Algal and nutrient samples were analysed by the Australian Water Technologies Laboratory, Sydney. Bureau of Meteorology, 2006. www.bom.gov.au/climate/glossary/soi.shtml. Redden, A. M. & N. Rukminasari, 2008. Effects of increases in salinity on phytoplankton in the Broadwater of the Myall Lakes, NSW, Australia. Hydrobiologia. doi: 10.1007/s10750-008-9376-2. Wilson, J., 2008. 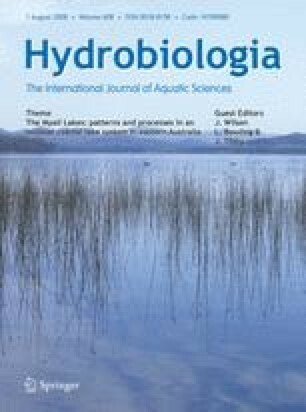 Nutrient and phytoplankton responses to a flood event in a series of interconnected coastal lakes: Myall Lakes, Australia. Hydrobiologia. doi: 10.1007/s-10750-008-9377-1.